We can imprint initials on combs. Please tell us exactly what you would like imprinted on them. We charge for $1.00 each comb imprinted. 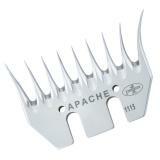 If you would like your comb imprinted, you must choose item #868600 (enter this item # in our Catalog Quick Order). Fits Premier's 4000s or any 3" shearing head. Premier offers a resharpening service for all combs, cutters & blades. Use item #87000 for resharpening combs. 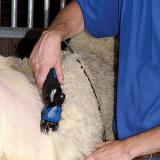 Remove blades/combs/cutters from clipper or shearer. Clean blades/combs/cutters immediately after use by using a small brush or blowing off any excess dirt or hair. Cover with oil to reduce risk of rust. High carbon steel clipper blades will rust overnight. Rust destroys both edge and polished surface of blades. To reproduce the quality of the cutting edge on the clipper blades that came from the factory, a lapping machine must be used. Most other methods are, in our experience, inferior. In addition to producing a cutting edge that won’t last, some methods can permanently damage blades. The most common “culprit” is using large high speed grinding wheels that are used to sharpen cutters and combs. Who uses lapping machines and who does not? Premier does and you can ship them to us. Other firms also use systems/machines that work well. Warning: Clipper blades/cutters/combs that have been sharpened by inferior methods or inexperienced people may be damaged to such an extent that they can never be restored to a satisfactory cutting capability. The same is true of blades that have become too heavily pitted by rust. Make sure the comb & cutter are on as described in the instructions. Make sure the comb name can be read on outside when placed on head. Make sure to have 1/8" space from end of comb (bevel) to tip of cutter. Make sure the edge of the cutter does not go over the side of the comb. Make sure the tension is set correctly. For securing combs to shearing machines. 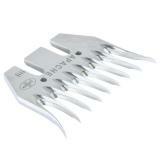 Provides more leverage than a normal screwdriver and fits comb screws on all major shearing units. Resharpen your blades, combs or cutters. Rapid turnaround, precision finish, low cost! Custom-engraving available. Recommended: 10 out of 10 said they would recommend this product to a friend. I'm normally not one to write reviews but after reading the reviews on this comb and using it this year I'll never use anything else to shear my sheep. I have Hampshire, Suffolx and Polypay sheep and they are in the fields all year except while lambing so their wool is far from ideal. Blades I've used in the past don't usually work well on the dirty wool and dull super fast. This year I used the apache with the ceramic cutter and its a winner combo. 17 sheep in and they are still sharp and ready to use next time. I have been shearing for over 30 years and use these combs for over 95% of my shearing jobs. They leave enough cover on the sheep during cold weather shearing and also enough cover to help prevent sunburn for those jobs in the summer. They hold an edge well and are reasonably priced. A great value in all respects. This is the best comb to have for shearing all breeds of sheep. I've been sharing my own sheep for over 15 years and this is my favorite comb. I have Suffolk and Dorset, Shetlands, Katahdin crosses which can be difficult to shear but not with this comb it goes right through the wool the first time which is great because I spin my sheep's wool. With selling my sheep for me I love this comb because you don't nick the sheep much. Plus it leaves a short layer of wool on the sheep so they do not get sunburned as well. Opinion this is the only comb to have. And it works great on rams because they are very thick wooled. And some of my sheep are very dirty and it goes right through the dirty wool as well. Stays really sharp for many sheep to be sheared. A+. This is the first comb and cutter I have bought from premier. I will never buy from any where else again! I have been shearing our Suffolk and Dorset sheep for 20 years with the oster grazer and decided to try the apache because I'm sick of getting halfway though a sheep before having to stop to clean the blades. This year I sheared more than 20 sheep without having to stop once and it's still as sharp as the first time and stayed cooler than the oster blades. I admit I was scared to use it at first and thought it would cut skin horribly, but it does not more so than the grazer I have been using all these years.